Want to connect with Mara? My name is Mara Casey I am a university student home for the summer. I have looked after many pets before and I am very experienced. I love animals and especially dogs, I have also cared for cats, birds and even hamsters, rats and gerbils! I have a very open schedule and would love the opportunity to take care of your pets with the best possible service I can provide! 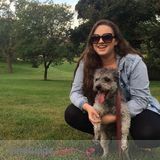 Dog lover looking for new fur friends to enjoy the outdoors with!